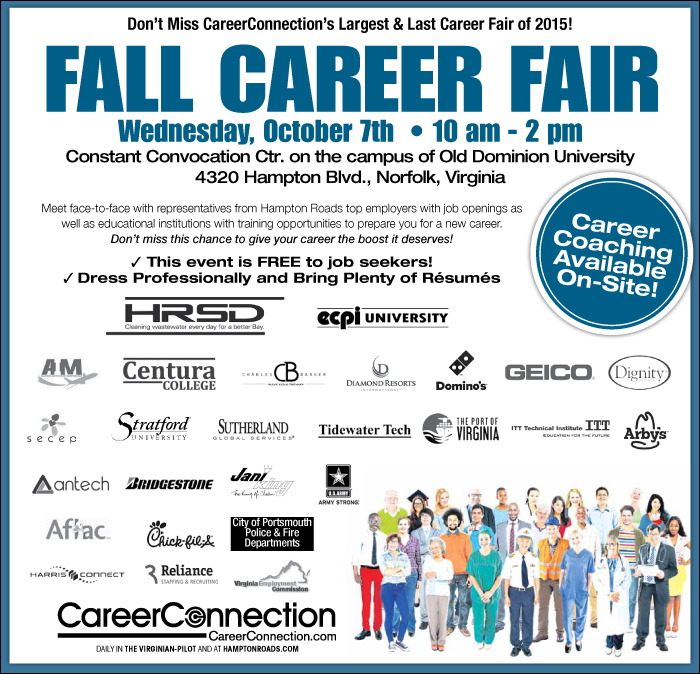 Wednesday, October 7th from 10 a.m. - 2 p.m.
JOB SEEKERS: CareerConnection's biggest and last career event for 2015. Meet face-to-face with representatives from Hampton Roads top employers with job openings as well as educational institutions with training opportunities to prepare you for a new career. Don’t miss this chance to give your career the boost it deserves! This event is FREE to jobseekers. Brush up that resume and dress to impress. Latest updates for this event on Facebook. Check out CareerConnection's new Facebook page. Get information and tips to help you land your new job.